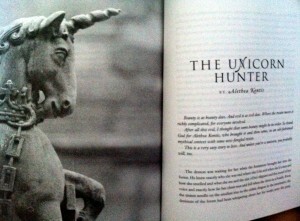 “The Unicorn Hunter” is the one I’ve been gushing about — the one from the Enchanted universe. It’s the story I saw in my head when I looked at the original Twilight cover. 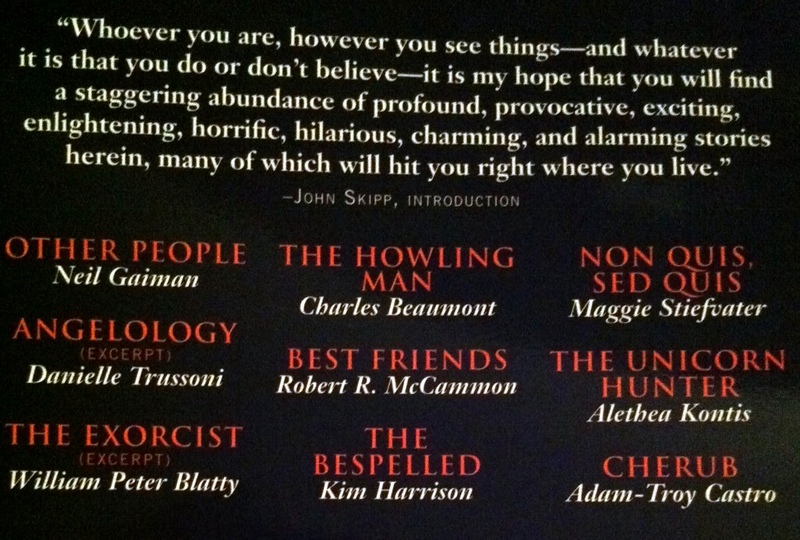 Imagine my devastation when I later found out that Twilight was about vampires. CRUSHED, I TELL YOU. This link, like Halloween, is only good for a limited time, so check it out & share it with the world while you can! Also, I’d love to hear what you think — feel free to comment on this post, fill out the email form at the top of the website, or email me directly at akontis at gmail. Buy the DEMONS anthology here. Add Enchanted to your Goodreads list here. Jo Ramsey kindly invited me to do a guest post over at her blog today. I was welcome to do whatever I wanted — song, dance, juggling, blog about my life, blog about writing, or do an interview with one of my characters. This is a trend in genre fiction — especially with YA and Romance — where authors submit an interview as if someone had interviewed one of their characters. I have never done this before, and it posed an interesting quandary. Do I interview the character as she was before the story, or do I interview her after the story has already changed her life? I knew that I wanted to interview one of the characters from “The Unicorn Hunter,” my short story in John Skipp’s DEMONS anthology (that is out right now). Ultimately what I decided was to interview my princess in such a way that it MADE you want to run out and read the story. Was I successful? Well, I guess you’ll have to pop over to Jo’s blog today and find out for yourself. 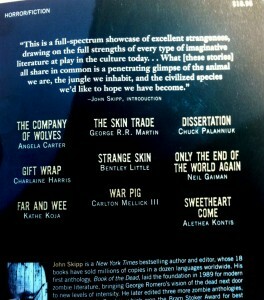 I am on the back cover AGAIN! Wheee! After all this evil, I thought some beauty might be in order. So thank God for Alethea Kontis, who brought it and then some, in an old-fashioned mythical context with some new-fangled twists. This is a very easy story to love. And unless you’re a unicorn, you probably will, too. I’ll say it again: This is the best story I HAVE EVER WRITTEN. Not kidding I swear. I’m gonna be FAMOUS. Go buy it now. RUN. Click here to purchase Demons on Amazon! Anyone who’s ever edited an anthology knows: there is a method to the madness. Some philosophies differ, but the two most important stories in an anthology are 1.) the opener and 2.) the closer. You want to start strong…and possibly end stronger. Yes, even in literature, it’s fine if you want to eat dessert first. 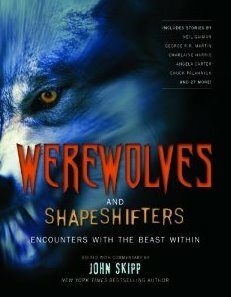 Last year, John Skipp released a similar anthology called Werewolves and Shape Shifters: Encounters with the Beasts Within . It was (and still is!) an amazingly diverse anthology, filled with tales ranging from heartbreakingly sweet to positively gory (mine was one of the former). The incredibly impressive table of contents started out with Angela Carter and ended with…ME, closing the book out directly after Neil Gaiman. So late last year, when Skipp sent around another hush-hush email saying that he was looking for stories for another anthology — one about demons this time — I immediately said yes, as I had promised. And then an even more amazing thing happened: I had an epiphany. I had been toying around with a story line for quite some time…decades, even…one involving Snow White and a Unicorn Hunter. For only Snow White knows what happened to her in the forest between the time the huntsman left her to die and the time she found the dwarves’ cottage. And really, who *better* to use as a lure for hunting unicorns than the purest, fairest princess in the land? But there was something missing, and I didn’t know what…until I got Skipp’s email. The moment I read the word “demon,” I knew exactly where she got those iron shoes — you know, the ones she made her evil mother dance in at her wedding. So in four days I sat down and wrote the most amazing story I think I’ve ever written to date. I laughed; I cried; I didn’t want to let it go. It was one of the first three stories accepted into the anthology (I think Adam and Neil were the other two). I was so incredibly excited about it and couldn’t wait to share it with the world…only it was a secret and I couldn’t tell anyone! Well, it’s not a secret anymore. 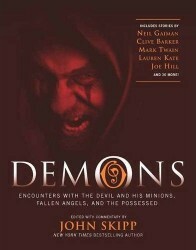 John Skipp has officially announced the table of contents, and you can officially preorder Demons: Encounters with the Devil and His Minions, Fallen Angels, and the Possessed (nice title, eh?) off of Amazon already. Please notice that this time Neil and I have switched places there at the end, just to mix it up a bit for you. Oh…I wish October would hurry up and get here. I can’t wait for you to meet my princess! Today’s blog entry can be found over at Evelyn M. Byrne’s “DO YOU KNOW YOUR NEIGHBOR?” site. Evelyn has been hosting a whole series of essays about paranormal figures…this week has been about werewolves. For a different perspective on things, I offered her the idea behind the shapeshifting wolves in my story “Sweetheart Come” from the John Skipp anthology that came out last October. I refuse to call them “werewolves”, because the term is a bit too modern. My pack are definitely wolves, but a race of wolves so old and revered that they have taken on a bit of the magic of the Wood itself and become something like gods (as wolves throughout history are wont to do). The power of the full moon is enough to help them turn human…if only for a little while. I actually did research for this one. You should read it. And if you don’t mind, please leave a comment with Evelyn thanking her for having me. It’s only polite. It was all the rage in high school: South Carolina Governor’s School for the Arts. As a junior or senior you could audition for their summer program in one discipline: visual art, ballet, drama, singing, writing…there may have been others, but two of those defined who I was. There was only one problem. I had to choose between them. My junior year, I tried out for drama because Casey was trying out for drama. It was an easy in–after all, I’d already been a TV star. I got my monologues together and had them down pat. Mom and I spent countless hours trying to find the best piece for me to sing — Mom’s favorite was “I Enjoy Being a Girl” from Flower Drum Song, but I ended up settling on a section from Diana’s “Nothing” in A Chorus Line. I remember the looks on their faces when I opened my mouth and belted out that song: actual, literal, astonishment. Simon Cowell had that same look on his face when Susan Boyle opened her mouth. Casey got in. Even Julie Gottlieb, who could do no wrong, waltzed straight in to her audition in a baggy shirt and jeans and got in. But not me. We all got over our astonishment eventually. I spent the summer writing ridiculously long letters to Casey and sealing them with crayon wax. My senior year, I tried out for writing. My friends Chris McCormick and Michelle Detorie did too. Now, I’d been writing for just as long as I’d been acting — and more regularly — so this was an even easier in. For the audition piece you could submit ten poems, three short stories, or a section from a novel-in-progress no longer than ten pages. I had all of those but I chose the third. I had the perfect piece–the climax of The Golden Band–where Cricket uses her powers to fulfill the prophecy and put the broken world back together. It had tension and emotion and poetry and everything. It was perfect. So we submitted these pieces with our application. On the day of the “audition” we attended a classroom lecture about writing, and then spoke to the judges after the class. I knew I wasn’t going to get in after the first five minutes, when the lecturer wrote “SLICE OF LIFE” on the chalkboard. I have an issue with “slice of life” writing. Mainly, I hate it. I never liked reading books where the protagonist is sitting on the front steps contemplating suicide because she’s just started her period and her parents are getting divorced. That’s not my life. My parents have been married my entire existence. They travel the world and have hotels full of people wave goodbye to them with white cloth napkins. They make friends with strangers on airplanes and get invited to weddings at the Vatican. They’ve always brought home trinkets and stories of magic and wonder to go with them. We lived in a giant brick house on a lake that my friends still visit in their dreams. We had wonderful adventures there. This was my life. No matter how you sliced it, it didn’t have depressing crap crawling under the surface like maggots. And even if it did, I wouldn’t tell stories about stuff like that. Telling stories about horrible things just makes horrible things immortal. You tell stories about wonderful things. That’s just the way of the world. “Yes,” was all I had to say. Because it was the truth. And if they didn’t want that, then they didn’t want me. That night, Michelle called me on the phone–which was a surprise, because we hadn’t really talked that much before. She was so scared about what had happened that day. She just knew she wouldn’t be getting in, and she begged me to give her my acceptance when it came. I calmed her down and told her to be patient. The letters hadn’t even been mailed yet. She could still get in. Chris and Michelle both ended up getting accepted. I lit a candle and burned my rejection letter from Dr. Virginia Uldrick to ashes in the backyard. The family went to Greece that summer. Yesterday, I received texts from both the Fairy GodBoyfriend and Leanna Hieber with pictures of John Skipp’s Werewolves and Shape Shifters anthology — it’s on tables at B&N all over the country, apparently (look for it!). As a gift, FGB purchased a copy for me. It was lying on the bed when I got home. It’s a gorgeous book, chunky and beautiful and heavy, with illustrations for every story. For a while I just petted it. (Pick it up at the bookstore. You’ll see what I mean.) And then I flipped it open. There are thirty-five stories in the book, and I’m the last one. The anchor story to Angela Carter’s entre, right after Chuck Palahniuk and Neil Gaiman (talk about a dream come true). Skipp didn’t tell me what he’d written for my introduction, so it was a surprise when I got there. I couldn’t help myself. I started reading. I read about what happened to Sasha, and her daughter, and her daughter’s daughter, and the birth of the great-great grandson whose adventures begin this particular legend. From his strange and magical family he learned how to tell the difference between good mushrooms and bad, how to play a variety of instruments (but he was best at the violin), and how to sing the sun down from the sky. It is the same farewell song every night, and it is included right there in the story. Now, these are not lyrics from “Sweetheart Come” — Doug and Kyle were very specific that we be inspired by Nick Cave but not infringe on copyright in any way, shape or form. If you’re familiar with the song, just think of it as a soundtrack to this story. There are several violin solos in the song — close your eyes and you’ll see Bane, playing with all his heart. All the songs published in this story, all the poetry, they are mine. And the minute I read over that first poem, my eyes filled with tears. This is me. Songs and magic and tales told of adventures long ago. These are all mine. This is who I am. Yes, Virginia. This is indicative of all I write. Sorry it wasn’t your cup of tea.